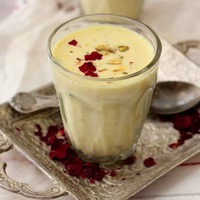 Basundi Recipe is a traditional Gujarati milk pudding laced with the rich flavor of saffron and dry fruits. We are slowly and steadily creeping into the celebratory mood with all the Indian festivals lined up in the coming month. During the festive season we don’t mind to come out of our cocoon and share some light moments with the loved ones. In our family gleeful memories are often interlinked with good food. The jubilant moments are shared with each other over a table laid with delicious homemade food.